Voodoo Vegas hailing from the south cost of England are one of the hardest working independent bands in all of the U.K. Having played in 14 different countries in the last 5 years and released 2 Crowdfunded albums the band are about to embark on the journey for the released of their 3rd Crowdfunded album. Check out some of the highlights of years gone by and look out for some highlights that are sure to come from the release of Voodoo Vegas album number 3. Travel to Spain to begin work on recording the new album with Will Maya at Los Rosales Studio near Madrid. The get booked for The Western Music Festival in Cheng Du China, sadly 2 weeks before the gig the festival is cancelled. The band begin work writing their 3rd album. Voodoo Vegas release 2nd album ‘Freak Show Candy Floss’ to great acclaim. Killing Joke music video featured on Scuzz UK TV. Play shows with Joe Satriani and Phil Cambell. Interview on MTV Slovenia and Sky News Slovenia. Voodoo Vegas enter studio with producer Will Maya (The Answer - No.1 album on rock charts 'Raise A Little Hell) To Hypnotise EP. The band launch Pledgemusic campaign for debut album 'The Rise Of Jimmy Silver' - incredibly hitting target in 24 hours. 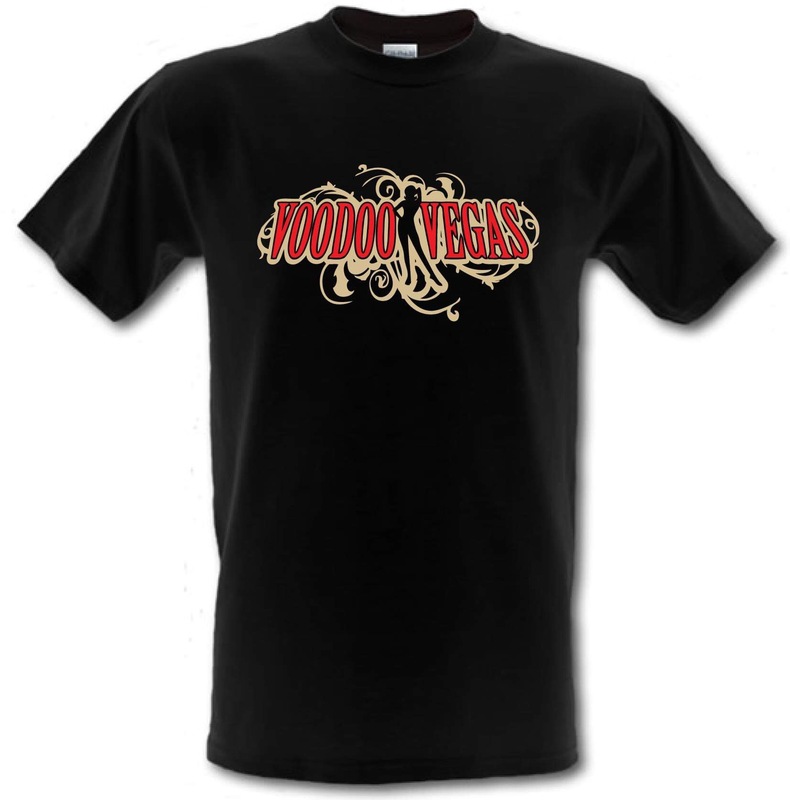 New Gold and Red Voodoo Vegas Logo Black T-Shirt. High Quality print on a black Gildian Shirt.